All transactions are safe and secure with a reliable history in online purchasing behind each of our associates. 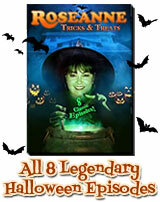 Buy the Roseanne Halloween Collection DVD to own Roseanne clothing and merchandise. If you're looking for some of the best Halloween TV show episodes ever created, start a tradition of watching this Roseanne Halloween Tricks & Treats DVD. The priceless compilation includes eight episodes (one more than the previous Roseanne Halloween DVD) and features guest stars like George Clooney, Sandra Bernhard and Ed McMahon. These ghoulish episodes were alotted enormous budgets and as a result showcased costumes that are still talked about today. In addition to the Roseanne Halloween Collection DVD above, browse the Roseanne Clothing Gallery for more apparel like men's and women's clothes, kids shirts or hoodies.